I’d like to welcome you to Little Eco Footprints first ever guest post. For something a little different, today the Childhood 101 contributors are planning a game of online tag. Debi of Go Explore Nature is here sharing tips for getting outdoors when it’s cold, while I’m over at Small Potatoes sharing tips for encouraging independent creativity in kids. For those that haven’t met Debi before, she’s a Los Angeles-based wife, mom and adventure guide for two young boys. Her blog Go Explore Nature is all about getting kids and families outdoors and connected to nature in the backyard and beyond. Check out Debi’s tips below and then follow the link at the bottom of the post to join our game of online tag. Colder, shorter days can only mean one thing: Winter is coming. And let’s be honest, it’s tough to get motivated to spend time outside when it’s cold. It might take a little more preparation, creativity and an adventurous spirit, but spending time outdoors when it’s cold can be done. The most important thing you can do to embrace the cold is to make sure you have the right clothing for both kids and adults. To keep warm and dry, dress in layers (that is, a base, mid and top/outer layer) and look for lightweight, waterproof clothing. Don’t forget to keep heads, hands and feet warm as well with hats, gloves or mittens, and waterproof boots. 2. Keep it short & active. In cooler weather, set realistic goals about how much time you think you can spend outside. Don't expect to spend your whole afternoon outdoors; aim for just 15 minutes instead. The fresh air will boost everyone’s moods and once you’re outside, you might wind up staying there awhile. While you’re outside, choose fun activities that keep the kids moving. Think running, dancing, jumping, digging, building, chasing and walking. Not only does active play help get the blood flowing, it’ll keep everyone engaged and forgetting about the fact that it’s cold outside! 3. Have warm food & drinks on hand. Even if you’re only outside for a little while, bring along something warm to eat or drink. Kids (and adults) do better when they are full and warm from the inside out. Some ideas: A thermos of hot chocolate, soup, chili, stew, or macaroni and cheese. I love vintage and pre-loved clothing. Clothes that are durable and timeless appeal to me far more than the mass-produced disposable clothes of today. Durability aside, favouring pre-loved is an easy way to minimise the negative environmental and social impacts of my wardrobe. From wastewater emissions to air pollution and energy consumption, the textile industry weighs heavily on the environment. There are also the social impacts to consider, with child labour and sweat shops sadly still being one of the key ingredients in cheap fashion and those bargain 2 for 1 specials. Buying pre-loved is a bit like treasure hunting. I pop into op shops regularly and quickly browse through the clothes. I have a mental note of what I’m looking for and more often than not leave empty handed. But sometimes I strike gold and discover something I need and love. The op shops I frequent today are far nicer than the ones I visited in my teens. These days they are typically tidy, uncluttered and the clothes are sorted into sizes or colour coded. A handful of friendly old ladies who like to chat usually staff the counter which adds to their appeal. But I know there are many people who can’t bear to sort through racks of unappealing clothes to find that one rare treasure and who wouldn’t be seen dead in an op shop. Thankfully sorting through an op-shop rack isn’t the only way to score a vintage find. Boutique style vintage stores are popping up everywhere and online options for buying pre-loved clothing are rapidly growing, particularly for kids clothes. There’s a suite of online stores dedicated to selling pre-loved clothing that is usually in as-new condition including designer labels. Clothes swaps and pre-loved clothing markets are also on the rise. Here in the Hunter we are lucky enough to have a regular pre-loved recycled fashion event – Raid My Wardrobe. Now in its third year, Raid My Wardrobe is a vintage and pre-loved clothing feast where 45 stall holders’ clear out the contents of their wardrobes and shoppers have a chance to buy preloved designer fashion and quality vintage at bargain prices. The next raid is next weekend Sunday 2nd June 10am – 1pm at the Newcastle Basket stadium, Broadmeadow. More information at raidmywardrobe.com.au. Is our fear of risk harming our children? I recently discovered there’s a bucket list for childhood - 50 things to do before you’re 11 ¾. The list of 50 outdoor activities aims to “encourage kids to get mucky, discover their wild side and most of all enjoy what Mother Nature has to offer”. It includes essential childhood activities like climb a tree, roll down a really big hill, make a mud pie, and cook on a campfire. I experienced each of these minor accidents during my childhood – along with a couple of broken bones. I consider these accidents a badge of a joyful childhood. They also provided an invaluable learning opportunity. Through these accidents I learnt to judge risk, tested my physical limits and learnt new skills. I improved my balance, learnt to enjoy the surf without being afraid and discovered what I could and couldn’t do on a bike. I also learnt that you can’t climb a really big tree, hang a hessian bag over a branch, then climb into it and expect to be able to hold your own weight. That accident resulted in a broken arm - and hopefully I earned a good dose of common sense a long with it. The impact of our risk adverse society on my daughter and her peers has been on my mind. 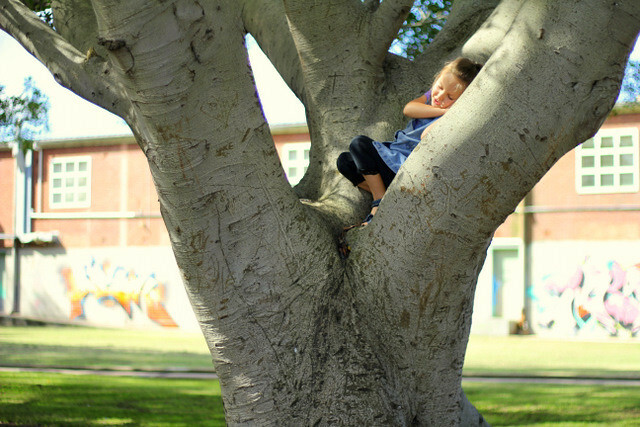 "small risks taken early (and the natural world is good place to take those risks) can prepare children to avoid more onerous risks later in life" Richard Louv. I’m keen to find a balance between reducing the risks of serious injury and allowing her to engage in creative, challenging, exciting and slightly risky play. I’m determined to quieten my paranoid coddling mum tendencies and provide ample opportunity for her to engage in independent outdoor play. I’ll be cheering her on when she races her bike down hills, climbs high up a tree, and learns to dive under a wave – despite the mum in me wanting to yell out “slow down”, “don’t climb so high” and “the waves are too big”. Because there’s some lessons that just have to be learnt sooner or later. Do you worry too that we are wrapping our kids in cotton wool and preventing them from finding their own boundaries? Outdoor play: Does avoiding the risks reduce the benefits? edited: I’ve popped back to leave a note on this scheduled post after learning of the heartbreaking loss of Kathreen Ricketson and her partner Rob. Kathreen was an inspiration to me, particularly through her Action Pack Magazine for Kids. Little Eco and I have spent many hours enjoying activities inspired by her work and will continue to do so for many years. I didn’t have the pleasure of meeting Kathreen in real life, but the sadness I feel at her loss has made me realise just how powerful this online world is. I contemplated deleting this post after learning of their tragic accident while swimming – because it seems a little heartless to write about risk. But given that Kathreen was passionate about childhood exploration and helping children connect with nature, I feel OK about leaving it as is. May her work continue to inspire children to create, explore, learn and connect with nature for many years to come. I’m learning that less is definitely more when it comes to kids’ birthday parties. Fewer guests, simpler food, and fewer activities make for a calmer and more meaningful celebration. Little Eco's birthday parties are getting simpler each year. For her fourth birthday I attempted a good-old-fashioned simple and frugal birthday party. On reflection I failed – the party was far from simple. There were old-fashioned party games and the food, decorations and party favours were all homemade. But the guest list topped 20 and I was busily preparing for days. I had my poor parents and sister cutting, baking, mixing and creating until late the night before. I fared better for her fifth birthday. I unashamedly outsourced and she enjoyed a farm party. Guests were fewer and the party was simple, waste-free and best of all Kate from Purple Pear Farm did most of the work, leaving me to enjoy the day. The food was simple - fruit kebabs, pop corn and fruit smoothies. A farm tour was followed by a seasonal story about bulbs and each child got to take home their very own baby bulb to care for. For her recent sixth birthday I finally applied the old rule of thumb to have as many guests as your child’s age plus one. Having less guests really worked and enabled her to actually speak to each of her friends - something I’m not certain she did at her previous parties. I nurtured her horse obsession by taking her and six friends horse riding. She really enjoyed sharing something that she treasures with her friends. Food was simple – pikelets, fruit and a bag of lollies of her choice and the tiny horse cake-toppers doubled as party favours. Her next party will hopefully be even simpler. In particular I want to provide time for unstructured play – something that has been lacking from her previous parties. Rather than shuffle the kids from one structured activity to the next I’d like to give them time to play and connect. I’d like Little Eco to grow up thinking that birthdays are a time to enjoy treasured friends, favourite foods, and a fun activity rather than extravagance and chaos. Do you have any tips for hosting a simple and meaningful kids birthday party? 50 outdoor activities every child should experience - How many have your children tried? I love this list of 50 things to do before you're 11 3/4. Kids can sign up at 50things.org.uk and track their progress achieving each activity. I'm looking forward to helping Little Eco sign up and working our way through the activities she hasn't yet tried. Any of these bring back fond childhood memories? There's so many activities on that list that make me smile. Climbing a giant tree and cooking my first damper on a campfire are probably two of my favourite. How are your children tracking? Little Eco has managed around 27/50 and I'm looking forward to helping her tick off the rest. The list was created by asking UK children to name their favourite outdoor activities, so there's a couple that may not be as relevant for Australian children - like conkers or pooh sticks. I'm looking forward to learning how to play those games. 50 activities not enough? Caro and Co wrote a great list of the 100 things she believes children should experience before they depart childhood. I especially love 'Fall out of a tree', and 'do nothing'.